It has been mango madness at casa White! Find out why my girls can’t get enough. Homemade granola is a cinch and all you need are a few pantry staples. Another slow cooker favorite for a simple and healthy weeknight dinner. This mixture of oats, pears, cinnamon and coconut is overflowing with hunger-fighting fiber and will keep you going strong all morning. 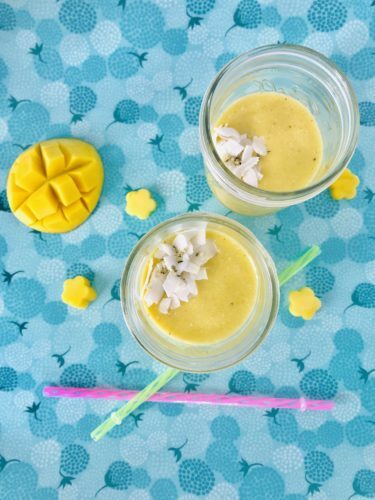 A frozen treat for little ones with a boozy grown up twist. 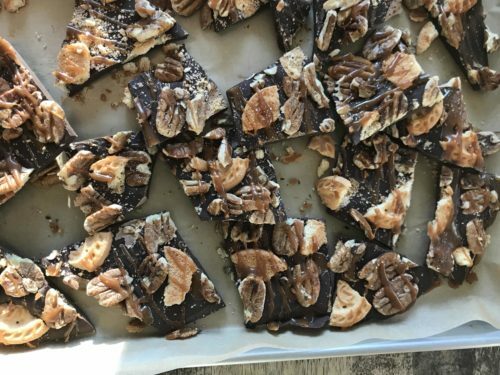 You always have time to throw together a homemade dessert with a few pantry staples. It has been mango madness at casa White. All three of my girls are in solid agreement (which rarely happens) …. mangos are the fruit of the season! 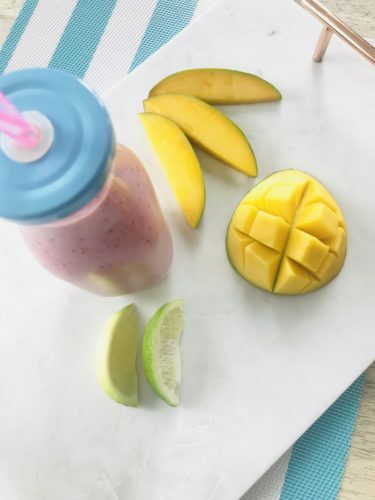 Whether it’s a healthy and fast breakfast, lunch box goody or a late night snack, we are reaching for sweet, juicy and brightly colored mangos that also has fiber and vitamins A and C.
I was thrilled to learn that mangos are always in season. The 6 main varieties found in the US peak at different times throughout the year so they are always available, which is helpful when keeping up with the high demand – we ate 4 yesterday! All of the varieties look different – so don’t use color for an indication of ripeness. Simply squeeze the mango slight and if it gives, it’s ripe! 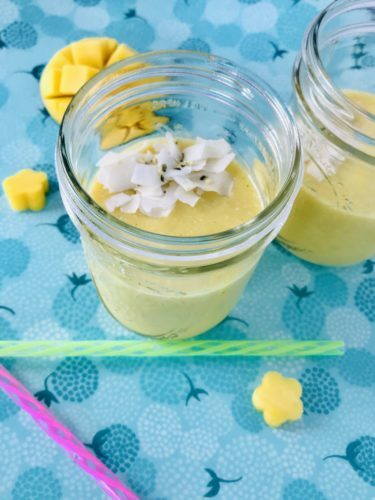 One of the most popular mango recipes in my house is this smoothie. 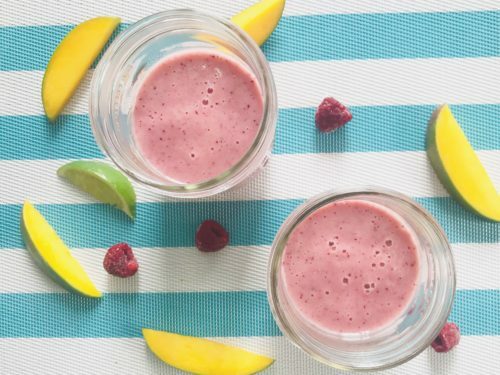 This colorful sipper has it all, plenty of fruit, protein and refreshing citrus tang. 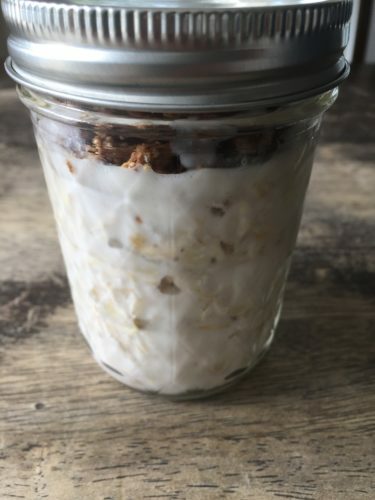 This is a breakfast staple for my 9 year old and also a very popular after school snack as the weather gets warmer. If you have any leftovers, freeze in popsicle molds! Want to learn how to cut a mango properly? Check out these step-by-step instructions and watch me demo it in this clip from last week’s appearance on Better Connecticut. My kids love them cut and turned inside out so they can just gobble the golden flesh right out of the skin. 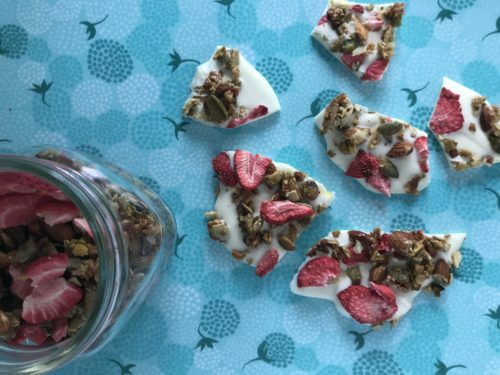 Making granola is so much easier than you might think. Here’s the latest family favorite. 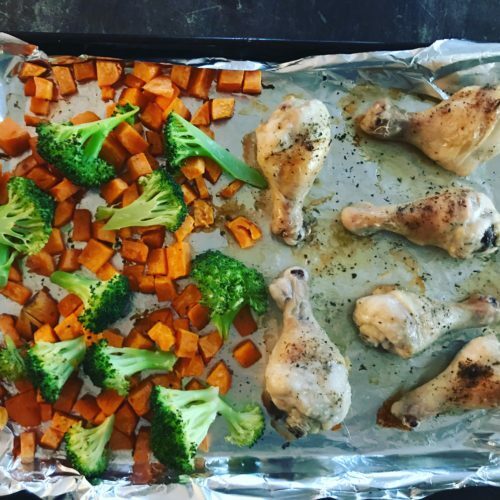 Preheat oven to 300-degrees F. Spray a large baking sheet with nonstick spray. Combine oats, almonds, coconut, salt, honey and canola oil in a large bowl. Toss well and transfer to prepared baking sheet. Bake, stirring occasionally, until golden brown (about 15 to 20 minutes). Remove from oven. Once cool, mix in dried apricots and raisins. Store in an airtight container for up to one week. 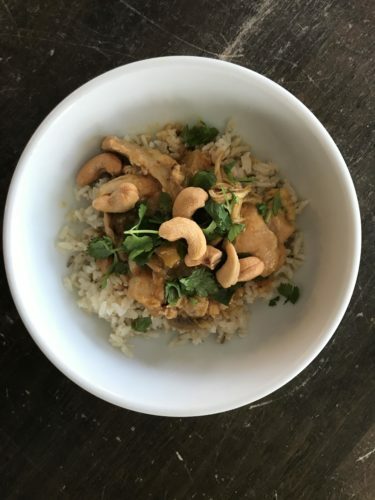 Another slow cooker favorite for a simple and healthy weeknight dinner. Serve with brown rice or naan bread. Place flour and salt in a large resealable bag. Add chicken and toss to coat. Heat oil in a skillet or slow cooker with a browning function. Shake excess flour from chicken and brown on both sides (it takes about 2 to 3 minutes per side). Add coconut milk, marinara, onion, garlic, pineapple, lime, ginger, turmeric, celery salt and cumin; stir to combine. Cover and cook on LOW for 8 hours or HIGH for 4 hours. Allow to cool for 10 minutes and taste for seasoning; serve topped with cashews, cilantro and a squeeze of fresh lime juice. This mixture of oats, pears, cinnamon and coconut is overflowing with hunger-fighting fiber and will keep you going strong all morning. No more excuses about not having time to eat – make multiple servings of this recipe and everyone can take their breakfast to go. 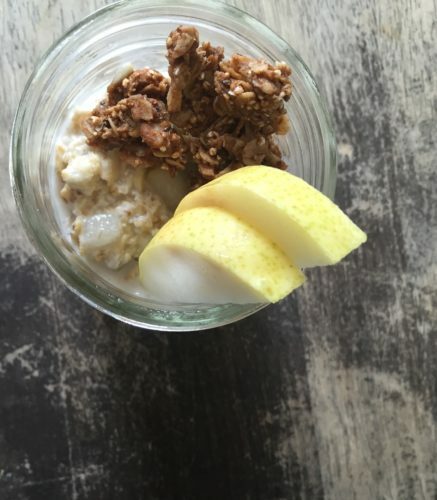 In a small jar combine oats, coconut milk, cinnamon, salt and pears; stir to combine. Cover and place in the refrigerator overnight. 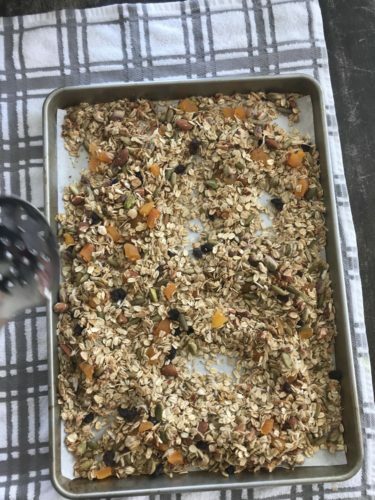 Top with granola before serving. A festive, colorful, and healthy way to beat the heat this Independence day! 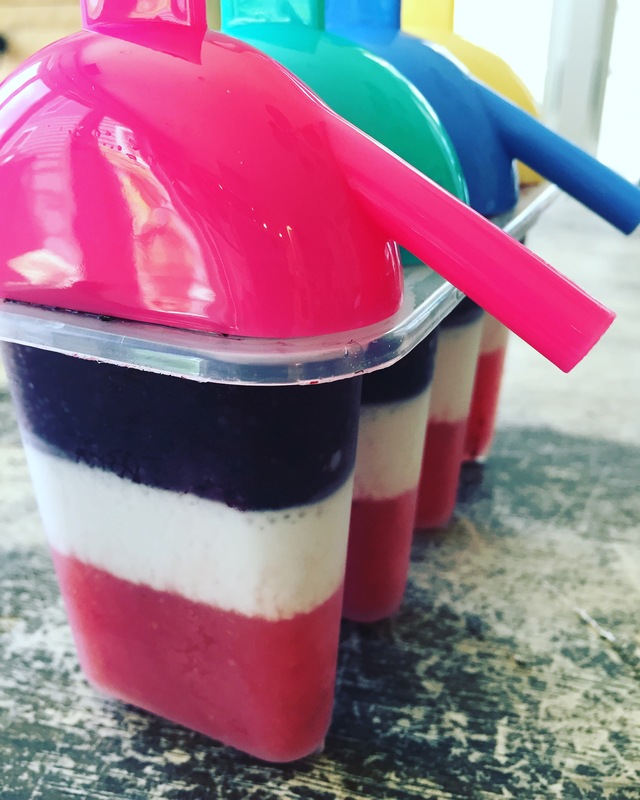 These layered ice pops use antioxidant-rich berries, melon, banana and coconut to create an edible version of those patriotic colors. Kids will swoon for these naturally sweetened ice pops (no added sugar in these babies) and a splash of tequila will turn them into a refreshingly boozy treat for the grown ups. Each layer needs some time to freeze so be sure to make these the day before your July 4th celebration. *Note – For the alcoholic version, mix 1 tablespoon of tequila with each layer and allow an extra 15 to 20 minutes to freeze between layers. Use different molds or add garnishes of fresh fruit so it’s easy to tell which ice pops contain alcohol. June is National Dairy Month and Chobani is helping me celebrate! 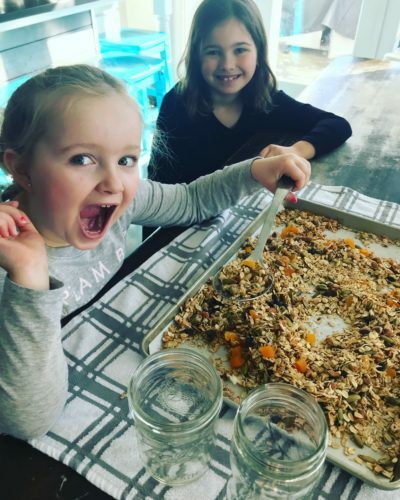 Getting in the recommended 3 servings of dairy per day may seem tricky so here are 5 delicious ways to help your family get more important nutrients including calcium, potassium, protein and vitamin D.
Remember this? Have you strayed? Bring back that ice-cold glass of milk with dinner each night. Each 8-ounce glass is 30% of your daily calcium requirement. Technically it’s 1.5 ounces but many folks aren’t sure what a serving of cheese looks like! As a visual guide, it’s about the size of a 9-volt battery or about ¼ of your smart phone. 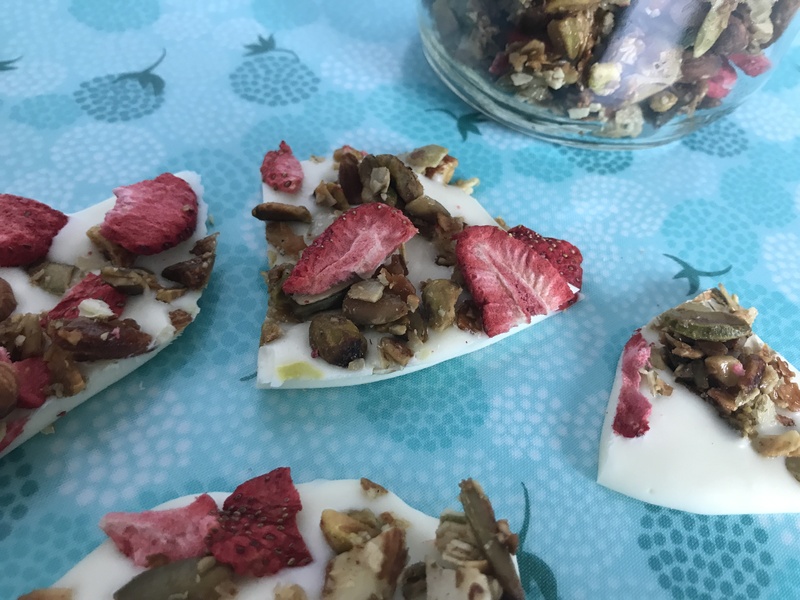 For camp or a lazy day in the back yard, have the kids munch on yogurt for a healthy and satisfying mid afternoon snack. Try out the fun flavors of Chobani Kids with 25% less sugar than other leading children’s’ yogurts. Add cottage to the blender in your next smoothie – it will boost the protein and make it extra creamy. Make plain yogurt part of your everyday recipes. Swap in yogurt for mayo and sour cream in sauces, dips and dressings. 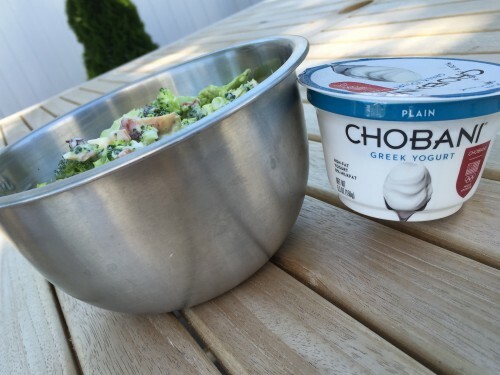 Chobani plain Greek yogurt is made with natural, non-GMO ingredients and has double the protein of regular yogurt. 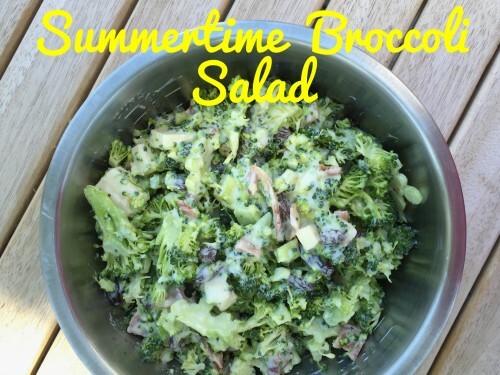 Extra protein means your go-to recipes super satisfying, like this recipe for crowd-pleasing Summertime Broccoli Salad. A tangy yogurt based dressing and some other nutritious ingredients means this salad packs in 10 % of your daily dose of calcium per serving. You can make this salad in advance; it actually tastes better once the flavors have a chance to mingle. In a large bowl whisk yogurt, olive oil, honey and salt. Add raisins, cheese, bacon and broccoli and toss well. Serve immediately or store in the refrigerator for up to 3 days. Melt white chocolate in the microwave or over a double boiler. Once melted spread on to a parchment lined baking sheet. Sprinkle with granola and allow to set until the chocolate is hardened. Pop in the fridge or freezer for faster setting.